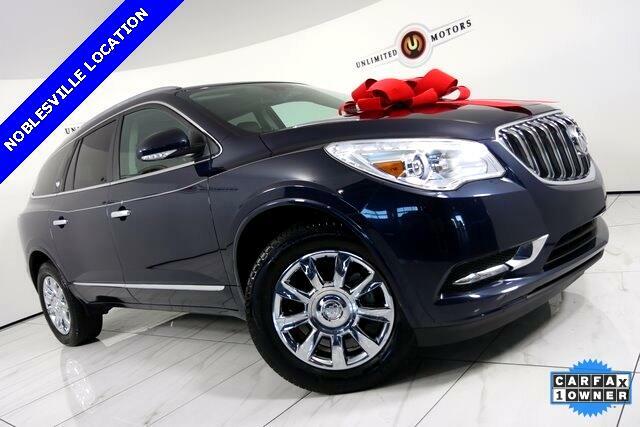 Back Up Camera, Bluetooth, Panoramic Roof, Heated Seats, Enclave Leather Group, 4D Sport Utility, 3.6L V6 SIDI VVT, 6-Speed Automatic Electronic with Overdrive, 3.16 Axle Ratio, 3rd row seats: split-bench, 8-Way Power Driver Seat Adjuster, 8-Way Power Passenger Seat Adjuster, Exterior Parking Camera Rear, Garage door transmitter, Heated Driver & Front Passenger Seats, Heated Steering Wheel, Memory seat, Memory Settings, Power Liftgate, Power Tilt-Sliding Moonroof, Radio: Color Touch AM/FM/CD w/IntelliLink, Rear Parking Sensors, SiriusXM Satellite Radio, Spoiler, Turn signal indicator mirrors. CARFAX One-Owner. Odometer is 2056 miles below market average! Priced below KBB Fair Purchase Price!